MicroTorque™ Analysis: MRI has pioneered the use of high-sensitivity, low-speed torque testing (MicroTorque™ Analysis) to reveal detailed information of the internal structure of rotating components. Our torque testers can detect torque variations as low as one millionth of an ounce-inch, showing the effects of lubricant, bearing, contamination and alignment issues. Review our Torque Analysis to learn more about torque measurements and how they relate to miniature ball bearings and other small rotating components. Or learn more Principles of MicroTorque™ Testing. 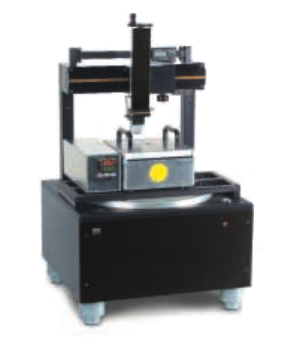 The M15W is the third-generation MicroTorque™ tester from Dynaroll Corp. It uses the same linear load cell technology as previous generations, giving the same ease of use and low fixture dependency, combined with a new Windows-based system that offers many additional benefits. 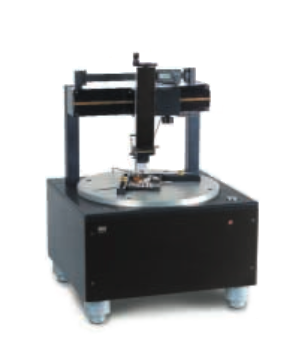 Sensitive torque measurement pioneered by Dynaroll's subsidiary company Measurement Research, Inc. (MRI) has become the de facto standard for the disk drive, gyroscope and other industries needing analytical information on part rotation. Advanced TorqueScope™ Windows-based system runs on any computer with RS-232C serial port. Enhanced programming capability allows user to easily create an unlimited variety of tests for many different torque-measuring applications. Rotation profile can be programmed for any speed (up to 4 RPM, as low as 0.001 RPM with special gearbox), any angle, any direction, with or without data measurement, in any combination - with looping capability. Gives unprecedented flexibility in setting up custom tests. Digital analysis of test data allows the user to set pass/fail criteria for most important torque functions, simplifying incoming inspection of parts. Test results can be logged to MSExcel compatible file. Learn more about the Advanced TorqueScope™ software that accompanies every M15W Torque Tester. The M15W's 12-inch diameter platter with removable 1C collet allows quick fixturing of many test parts. The platter has a standard hole pattern for mounting custom fixtures and also has movable fences that can trap a rectangular part anywhere on the surface. Small round parts are easily held in the collet, while larger parts can be mounted on the platter. The X-Z linear stages that comprise the load cell carrier gantry allow positioning of the force measuring device anywhere over the platter surface. The X stage has a digital readout on position in inches or mm to facilitate measurement of torque arm radius. Power: 100-120 VAC, 50/60 Hz. Note: Dynaroll reserves the right to change these specifications without notice.